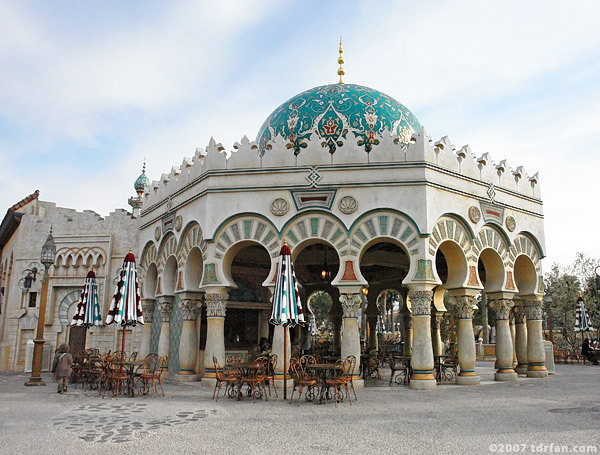 This beautiful building is a prominent feature of the Arabian Coast area of DisneySea. Inside, you'll find a counter-service eatery serving pita sandwiches (a rare find in Japan). The Sultan's Oasis is home to one of my favorite treats at DisneySea, coconut soft-serve ice cream. Somewhat ironically, this selection is only available in winter. There is seating outdoors, which is especially nice if the weather is good. A nice place to stop for a rest and a light bite.